Who knew that a confection as simple as candy corn could be the subject of such controversy? I absolutely adored the stuff as a kid, and really, what’s not to like- A simple, colorful candy that tastes primarily of sugar and very little else. Depending on your palate, I suppose that could be what inspires such hatred from detractors, and the soft, waxy texture may not do much to improve things, either. Still, this sweet little kernel deserves a break- A cheerful symbol of Halloween fun, it can even be vegan, if you have the patience to make it yourself. Unfortunately, I didn’t have the patience this year… But that doesn’t mean I’m going to spend the holiday without any candy corn. Regardless of your preference, this is one version of that classic candy that everyone can appreciate. It would be easy to whip up a whole bowlful of these felt sweets for decoration if you felt so inclined, or make two and turn them into earrings. I made mine into a magnet, and depending on what size you print the pattern out at, the options are pretty much limitless. So if you’re interested in making some felt candy corn, click here to get the pattern. Print it out however big or small you’d like, and cut out the pieces on the color of felt that each part indicates. To assemble, start by sewing one yellow bottom to one white piece; Line the bottom up over the bottom of the white piece, use a pin to secure it, and sew across the top with a whip stitch. Line up the middle orange piece right against that one, and sew along the bottom (in the same place that you just put your first line of stitches). Now sew up the top of the orange piece to secure it, and tie a knot at the back of the piece. Repeat with the other side. Embroider a face if desired. Line up the two pieces back to back, with the good sides facing out, and sew along the edges. If the white bits get in the way, feel free to trim them a bit so that the colors are continuous. Attach earring fixings, magnets, or whatever you please! LOVE IT!!! And thanks for the link to the pattern!! So cute!! 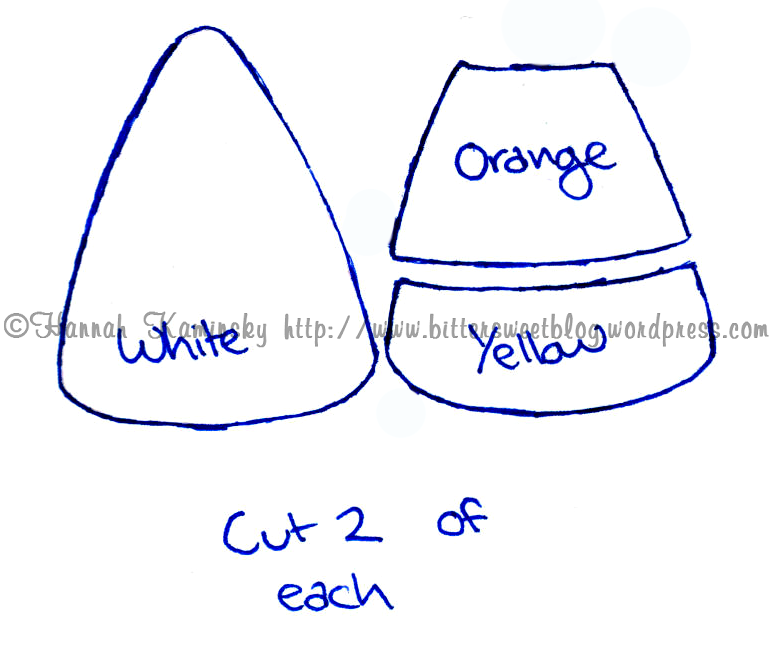 And looks alot easier than making your own real candy corn (although both sound like fun)…. OMG, OMG, OMG these are the BEST. I so wish I could sew. I have tried and tried but fail miserable…really, I literally can not sew on a button. Oh, that is… that is… that is so freaking cute. I love food with faces. Erm, food that is not meant to have had faces, ever, anyway. It’s “kawaii,” I love it. Easy Halloween gifts! God knows how I love easy and cheap. And gifts. I love candy corn and miss it terribly! It’s been at least 11 years since I’ve indulged in their sugary goodness. :( Your felt version definitely brought a smile to my face! Awww, I love them! I already made my candy corn batch for VegNews & I’m spent! Whether people like the taste or not…candy corn is like the ultimate mascot for the season and it would not be the same without it! I love your felt version! So cute! I’ve been doing some recipes w/ candy corn lately. Did you know that there is a whole website devoted to all things candy corn?? So cute and so easy! These would make excellent magnets. Definitely not scary, but definitely very, very sweet! Everything you make is just adorable, sweetie! Absolutely coo-inducing!! I love Mr. Corn!! this one is sooo cute! I LOVE these! However, I’m not the least bit crafty. Would you consider making them and selling them to me? I’d like to use them for a first grade math center since candy is not allowed in our school. Thanks for such a clever idea!